For either kitchen or, especially, bathroom countertops, I believe that Carrara marble laminates are an authentic vintage choice. I blinded myself searching for them among the 8 retailers of laminate in the U.S. today. Grace Jeffers, the materials expert who advises Wilsonart, wrote about the use of laminates that imitated marble in her write up for Wilsonart on laminates in the 1950s. She also shows laminates that mimic travertine, and points to the influence of modern designers. 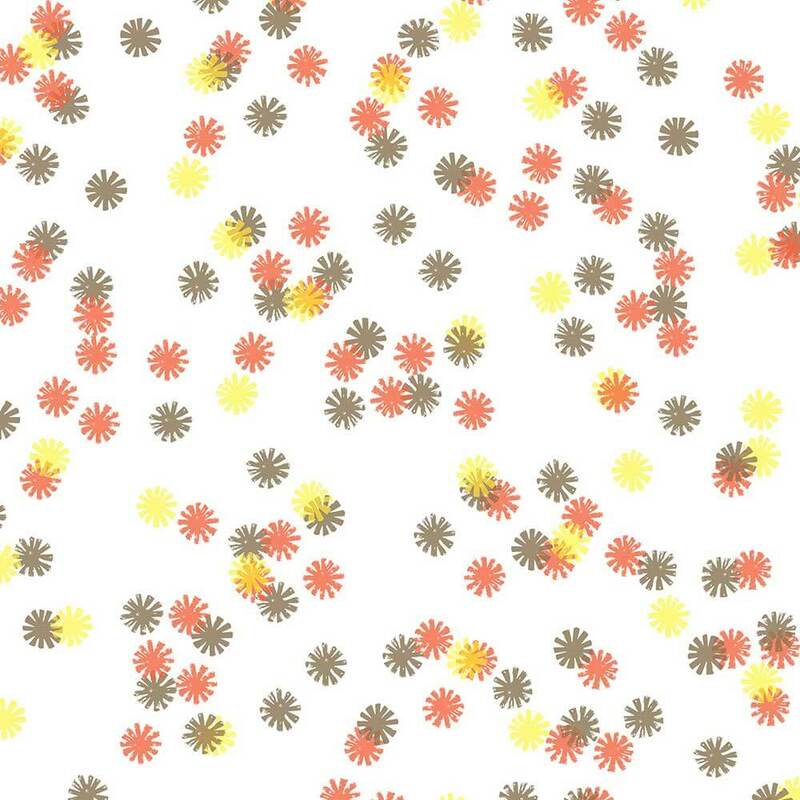 Moreover, in her thesis, Grace says that Formica introduced “Classic Cremo Marble” in the late 1950s — and that it “instantly became one of the company’s all time best sellers.” The pattern, she said, was discontinued in 1983. You can also get Formica White Onyx – which we know for a fact has been on the market in its present form since at least 1969. Researching this story, I learned about the difference between Carrara marble and Calacatta marble. Both are named for areas of Italy. 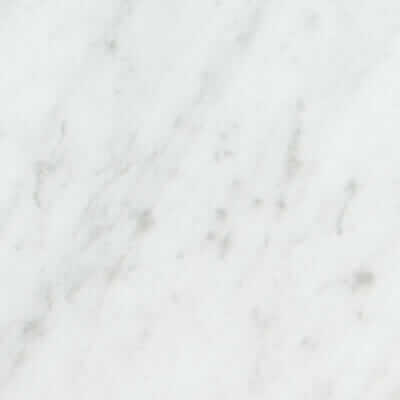 Carrara has denser, smaller, lower-contrast veins and is light-grayer in its overall effect. 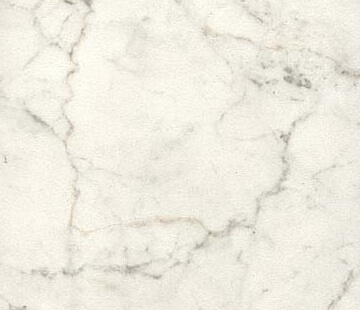 Calacatta has much larger veining and, as a result, a grey-on-white effect. 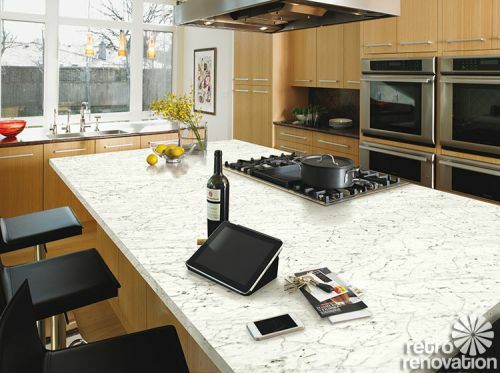 The larger-scale Calacatta is being pushed for contemporary homes today – both Formica and Wilsonart have it, part of the appeal seems to be that it has a huge repeat – 5′ – which means that in a kitchen it will be even less evident that it’s not real marble (real marble would have no “repeat”). Don’t ask me why, but I am guestimating that Cararra — not Calacatta — was what we had in old-skool times. Part of this guess is based on the fact that carrara marble has been in my conscientious forever — it’s been around. 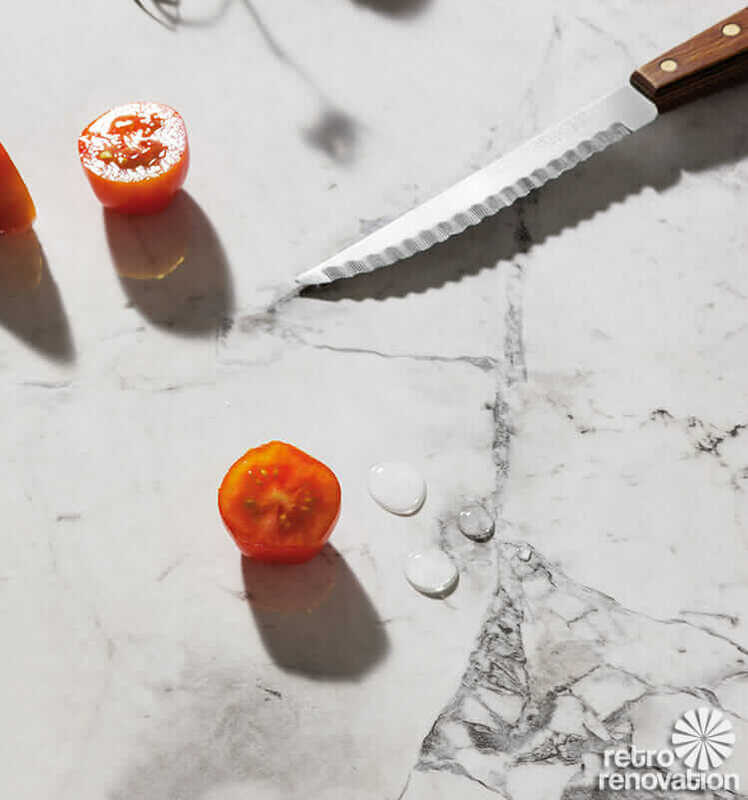 The big veining of Calacatta? I think that must have become “a thing” with McMansions. 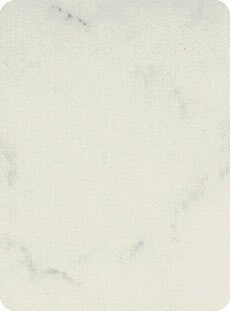 Above: Formica 6696-46 Carrara Bianco — I actually have seen a large sample of this one. The sample I have has the “46” finish, which is etched — that is, pitted. I love the patina! 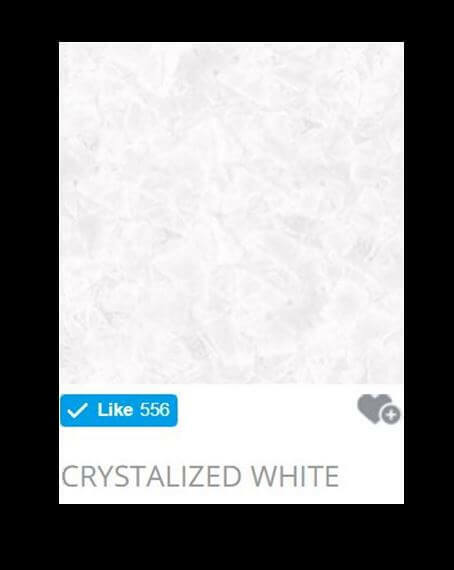 Above: Wilsonart’s White Carrara laminate — Get samples via their website here. Above: Abet Laminati’s 977 Rocks Carrara laminate — On their website here. Above: Arpa’s Marmo Sierra Beige — On their website here. Thanks so much for the wonderful research and pictures! Does anyone know if laminate can be used for the bath tub/ shower wall? I have terrible grout in my current house and would love to avoid it in my next place. The marble laminate is sooo pretty. Wilsonart says it can be done, but that correct prep is essential. I am not sure how to do the prep… Perhaps you can contact their customer service directly for help…. Good luck! I’m getting ready to tile my bathroom walls, and what I’ve learned from my research is that tile isn’t waterproof. I’ll need to build a waterproof substrate first and then tile over it. And I’m doing what I believe is the best thing possible, not just the code minimum. Because I can. I would imagine that you could do the same thing and glue laminate onto a substrate that’s suitable for tile. I’ll be writing about this in a month or so when I get around to actually doing it, if that’s any help to you. 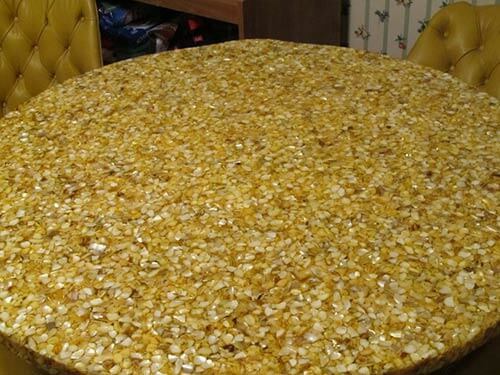 I have a feeling that if you’re not imagining this as a DIY project, contractors will think you’re crazy for wanting it. And general contractors may not waterproof it right, while tilers may not want to do the job because it’s not tile. Chad, you are correct. The downfall to laminate failure is water, and it’s not actually the laminate itself but the substrate in which it must be bonded. The home my parents built in the mid 70’s, like many other homes, was built with laminate shower/tub surrounds and there were no issues with proper care and maintenance. If there were any issues, they would most likely come from the moisture penetrating the substrate at the edges/corners/seams and thus the substrate swelling/rotting. The corners and edges had metal molding (chromed) that were glued/caulked into place to prevent moisture from penetrating to the substrate. 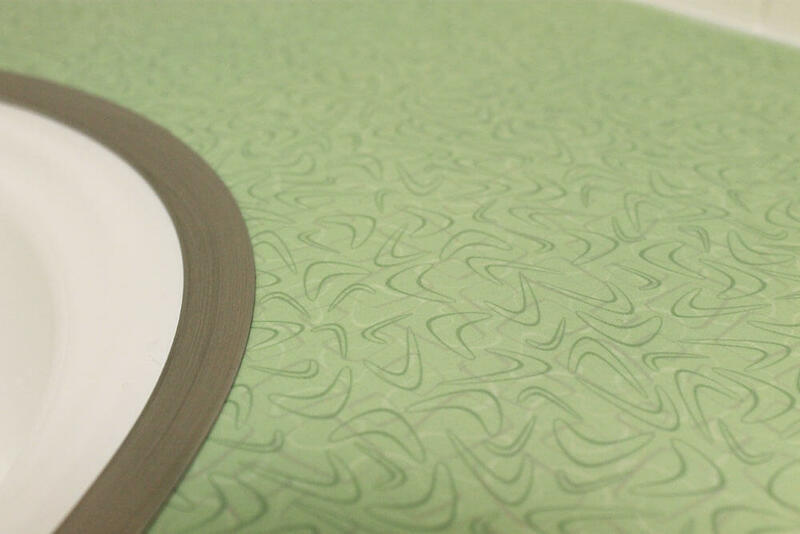 It would make sense to go ahead and bond to a moisture-resistant particle board or mdf, as these are approved laminate substrates. Moisture can be the failure for many products. I know this an old thread, but I noticed that Lowes has WilsonArt Carrara laminate in pre made sizes. They are special order, but free pick up in store. Some stores may have them in stock, not sure. We have what looks like the Carrara laminate in our master bath and laundry room, circa 1968. I LOVE it and wish it were in the kitchen, as well! It probably was in the other two bathrooms, but was replaced with boring beige stuff by the former owner, who had no taste whatsoever, He Who Took Out The Awesome Square Tub!